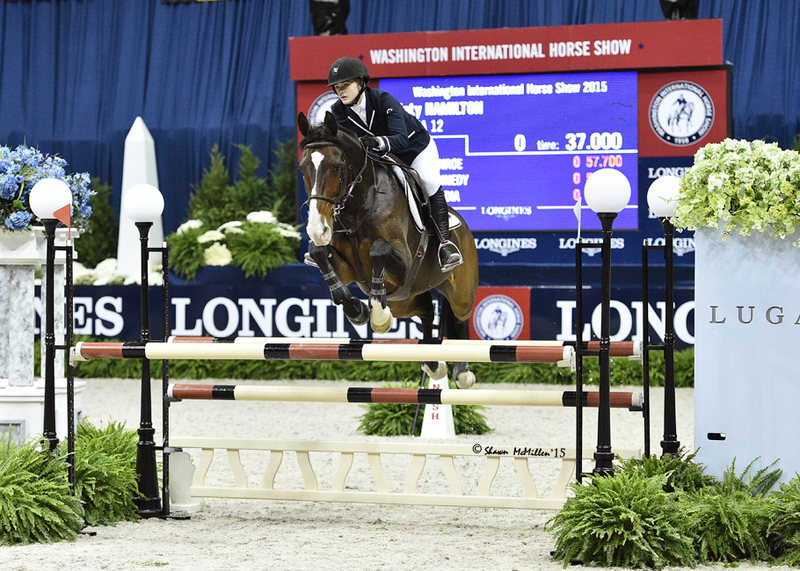 North Barrington, IL – October 25,2015 – Old Barrington Farm returned from the Washington International Horse Show (WIHS) with the Championship in the WIHS Children’s Jumpers and Reserve Champion in the WIHS Children's Hunters. Trainer Amelia McArdle coached rider Katy Hamilton to the win in the Children’s Jumpers and Carly Martin to a second place finish in the Children’s Hunter Championships. Riders compete in the WIHS classes at horse shows during the season to qualify for the indoor finals. Both girls also qualified for the North American League (NAL) Championships at the Pennsylvania National Horse Show, which was held last week. The championship format for these divisions is a difficult one, as there are no warm up classes and only one chance to make it to the second round. In a field of 30-40 of the top Children’s riders, making the top 12 is a great accomplishment, let alone earning a top placing. Katy Hamilton, 16, lives just a few minutes from the farm in North Barrington, IL. It was a dream of hers to even qualify, never expecting to win the $10,000 WIHS Children’s Jumper Championship, sponsored by Shamrock Ventures, aboard Sacha 12, owned by Old Barrington. Out of 32 entries, Hamilton was one of 12 to advance to the jump off, securing the fastest of six double clear rounds for the win. In the months leading up to indoors, Hamilton practiced different exercises to make sure they covered all the challenges the pair might face in the ring. They schooled Sacha in the indoor ring, practicing tighter turns and plenty of in and outs, since that was the biggest challenge for the duo during the season. Hamilton and Sacha earned a 9th place finish at The Pennsylvania National Horse Show (PNHS) in the NAL Children’s Jumper Championships. The experience there helped the pair to be better prepared for Washington. Hamilton’s lease on Sacha is up but she will be moving on to a new horse her family purchased to eventually compete in the Low Junior Jumpers. 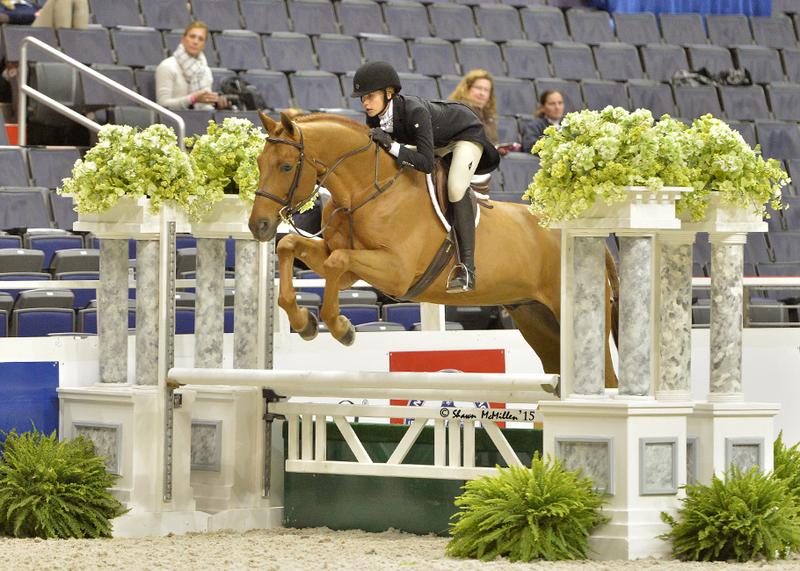 Carly Martin and Czech Mate took the Reserve Championship in the WIHS Children's Hunter Finals. Photo Shawn McMillen. 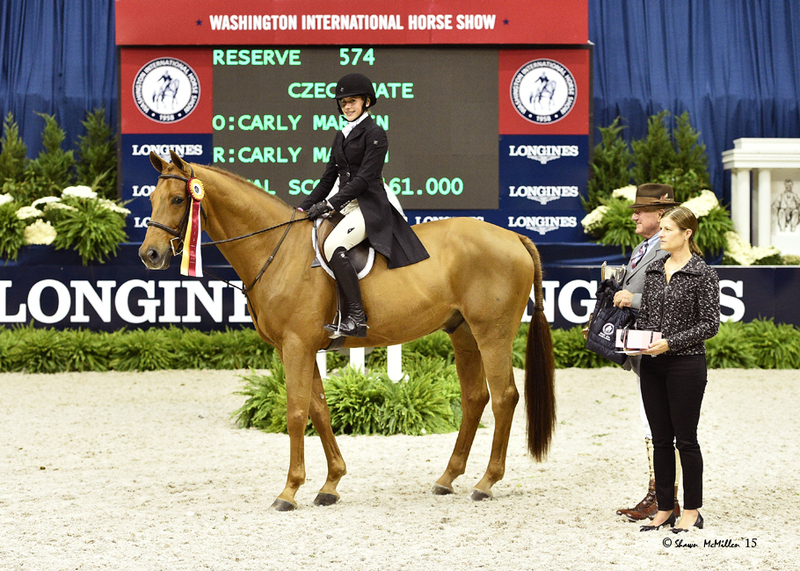 Carly Martin, 14, of Barrington, IL, brought another top prize home to Old Barrington Farm with her second place finish in the $10,000 WIHS Children’s Hunter Championship, sponsored by The Heisley Family Foundation. Thirty-two entries showed over a beautiful first round course with the top 12 returning for a second round. Martin and Czech Mate earned scores of 82 and 79 to total 161 for second place. “At Harrisburg I learned that I needed more of an even pace throughout my round and that I needed to start off the course with a lot of pace,” said Martin. Since this was Martin’s first time at indoors, McArdle along with assistant Julie Smith, prepared her by setting different courses with spooky jumps. The pair also competed in the IHJA Medal Finals in the grand prix arena to practice a tougher course. McArdle is familiar with preparing for the indoor championships from her own successful junior career, having garnered championships and top placings at indoors in junior hunters and jumpers herself. McArdle’s Old Barrington Farm is a beautiful 40 stall equestrian facility with a grand prix field, surrounded by estate homes and lots for sale for equestrian living. For more information on Old Barrington Farm and Old Barrington Estates, please visit their website at www.oldbarringtonfarm.com. Call or email to reserve your spot to audit. Limited rider spots also available.